Situational awareness: Adobe has bought Allegorithmic, the maker of Substance 3D tools, to extend its offerings for makers of immersive gaming and entertainment experiences. Don't forget: Login may only come out once a day, but you can get your Axios tech fix at any time. 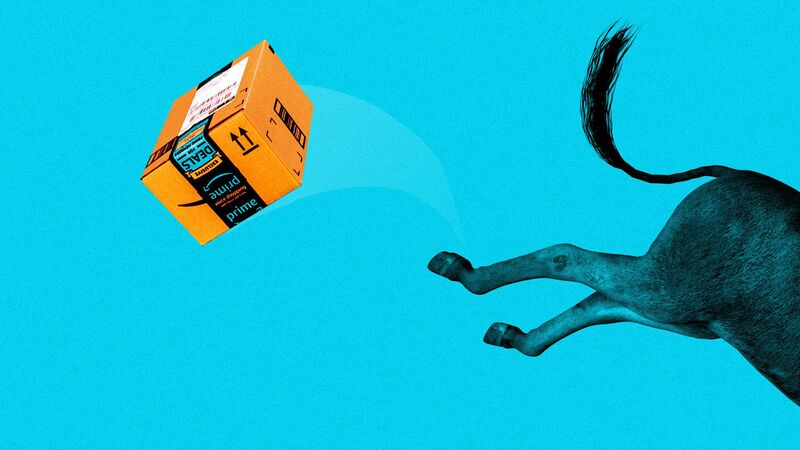 For newly emboldened progressive Democrats, Amazon has become a powerful symbol of economic inequality — and a potential target, Axios' David McCabe reports. Why it matters: The company already shows up in fundraising appeals, legislative rollouts and critical Twitter threads — and looms over the 2020 campaign trail — despite its popularity with consumers. In the last year, left-wing stars like Rep. Alexandria Ocasio-Cortez (D-N.Y.), Sen. Bernie Sanders (I-Vt.) and Rep. Ro Khanna (D-Calif.) have hammered Amazon over the way it treats workers, builds new offices with taxpayer dollars and consolidates market power. Unions and labor groups are organizing the company’s warehouse workers and employees at Whole Foods, which Amazon owns. Progressive advocacy organizations, including MoveOn.org and New York’s Working Families Party, have raised funds or built their contact lists off of their concerns about the company, according to ads archived by Facebook. The big picture: Democrats are gravitating towards the argument that big corporations like Amazon have benefited from their innovations — in Amazon’s case, a delivery network that brings consumers an endless variety of goods quickly and cheaply — while working people have paid a high price. “The story of Jeff Bezos represents both the promise and the challenge of the digital revolution,” Khanna said. He told Axios last year he was weighing whether there was a way for Congress to limit the kinds of municipal taxpayer-funded incentive giveaways Amazon took advantage of in its HQ2 selection process. Sen. Kamala Harris (D-Calif.) said via a statement: “As one of the most profitable companies in the world, Amazon should be subject to oversight that protects the dignity of workers and ensures fair competition.” An Amazon spokesperson noted that while the firm had recently turned solid profits, it was unprofitable for a long time. It doesn't rank among the most profitable companies on the most recent Fortune 500. Sen. Elizabeth Warren (D-Mass.) has said Amazon should be prohibited from providing a marketplace for third-party manufacturers while simultaneously competing with them by offering private-label products. Her office declined to comment. Sen. Sherrod Brown (D-Ohio), when asked if Amazon was emblematic of his concerns about an unequal economy, said it was, but that it wasn’t an area he’d studied closely. Yes, but: Amazon polls very well. Democrats recently told Georgetown University researchers that they had more confidence in the company than any other institution, including universities, the military, Google and the FBI. The bottom line: The progressive left is ascendant, thanks in part to an argument that big companies have delivered big wins to a small fraction of society while leaving everyone else behind. — Anand Giridharadas, author of "Winners Take All"
Education and technology were the central topics yesterday for Apple, Google and Microsoft, as they prepped for BETT, a key education trade show in London. Microsoft announced a new Classroom Pen stylus for its Surface convertible tablets and debuted a bunch of new low-cost education-themed Windows laptops designed to compete with Google-powered Chromebooks. The company also has some really cool tactile blocks that help blind kids learn to code. Google said that 30 million students and educators use Chromebooks, while 40 million use Google's Classroom software. Acer also introduced new Chromebooks. Schools are a key market both because of the large numbers of devices sold and because they help create brand preferences in a new generation of consumers. Oracle allegedly saved $401 million over 4 years by systematically underpaying women and minority employees, the U.S. Department of Labor said in a new filing Tuesday as part of its ongoing lawsuit against the tech giant. Oracle declined to comment. The bottom line: Silicon Valley may have a reputation for meritocracy, but recent scrutiny of the big companies' significant pay gaps is a reminder that tech is not immune from management biases common in other industries. The Labor Department charge, reported in Wired, echoes an independent analysis of Oracle pay data filed in a private lawsuit on Friday, which alleges the company underpaid women compared with male counterparts by more than $13,000, Axios' Kia Kokalitcheva reports. How it works: Lawsuits such as these, as well as a similar ones filed against other big tech companies, highlight the subtle, nearly invisible tactics that can make it difficult for employees to bridge the pay gap. Per DOL allegations, Oracle not only relied on prior compensation to set starting salaries, but it also tended to steer women and employees of color towards lower paid positions at the company, setting these employees on a path of underpayment for the remainder of their time at the company. Oracle also allegedly favored job applicants from Asia with student visas who rely on the company for sponsorship, making it easier for management to keep wages down. The agency also highlights that the pay disparity widened the longer these employees remained at the company. Other big tech companies, including Google and Uber, have been accused of using similar tactics to create systemic pay gaps for women and employees of color. Separately, Citigroup released new data last week about its employees that showed women make 29% less than men, and people of color make 7% less than white employees in the U.S. The data, which did not "adjust" for criteria like title and experience as companies often do to show "equal pay for equal work," highlighted that the bank's top and best paid jobs were overwhelmingly male and white. Meanwhile, the filing comes the same day that Intel said that it has eliminated its gender pay gap globally, including with regard to stock-based compensation. The bigger picture: The tech industry's pay gap isn't limited to wages. As a recent study found, women also hold much less equity in startups, which is how most tech successes bring fortunes. Viacom announced yesterday it's buying Pluto TV — one of the fastest-growing free, ad-supported TV streaming services in the U.S. — for $340 million in cash. Why it matters, per Axios' Sara Fischer: It's the latest digital technology company that Viacom has acquired over the past year to bring its brand, which consists mostly of legacy TV networks, into the digital future. Viacom has acquired several other digital companies over the past year, including millennial entertainment production company AwesomenessTV, digital video conference VidCon, and influencer-marketing company Whosay. Details: Pluto TV is a standalone app that has distribution deals across most streaming TV devices and a number of leading smart TVs. Pluto TV will get reach and resources for better growth. Pluto TV has a large network of content partners that includes major TV networks and film studios, but its core app users are much smaller than Viacom's — which consist mostly of pay TV subscribers, as well as digital streaming and social audiences. Viacom will receive digital streaming distribution and leverage for distribution deals with pay TV providers. Its digital streaming footprint will expand to Pluto's 12 million+ monthly active users, 7.5 million of which are on connected TVs — good for both audience development and getting more use out of its content library. The big picture: Free digital, ad-supported streaming TV companies are growing as consumers face saturated budgets for subscription content. "(W)e see significant white space in the ad-supported streaming market and are excited to work with the talented Pluto TV team, and a broad range of Viacom partners, to accelerate its growth in the U.S. and all over the world," CEO Bob Bakish said in a statement. The World Economic Forum runs through Friday in Davos, Switzerland. Mozilla hired Roxi Wen as CFO. A labor entrepreneur, a space environmentalist and the co-founder of Coworker.org are among the 2019 crop of TED Fellows. Check out what happens when it freezes at Niagara Falls.